The University of Redlands’ social media team invited Political Science Professor Renée Van Vechten to take over the University’s Twitter channel (@UofRedlands) on October 23 to answer questions, submitted live and in advance, about the upcoming midterm election. 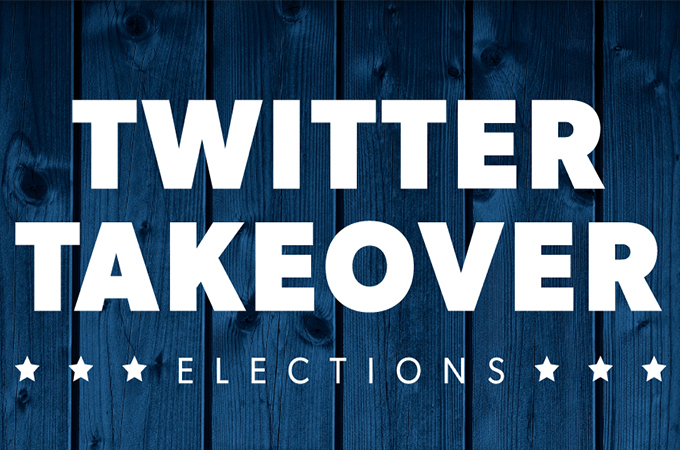 Using the hashtags #YourVoteMatters and #TwitterTakeover, Van Vechten (@profrvv) addressed issues from the nature of a “jungle primary” to California State propositions. Here is the exchange (edited for style and clarity). University of Redlands: Dr. Van Vechten, welcome to U of R's Twitter [channel]. It's all yours for the next two hours and we're excited about the conversation. Tell us how long have you taught at U of R and why you became interested in politics. Professor Renée Van Vechten: A professor with the Political Science Department for almost 14 years, I teach California politics and [topics in] American government. As Aristotle said just a couple thousand years ago... We're political animals, and politics is the stuff of life! Van Vechten: Your vote will count. Read the voter guide and arguments. Consult nonpartisan sources like the League of Women Voters. Ask questions. And you don't have to vote on every person or initiative if you aren't swayed. Can you make $1 with 99 cents? A single vote may not be the election tie-breaker, but there could be a different outcome without every vote. Voting also sends strong signals to your representatives about who's paying attention. They care more about those who do. If you're not voting, that IS your vote, and they'll assume you don't care. Should you? Yes, you should. Shelly Meyer (@Shelly_Meyer): I'm concerned that Congress has taken no meaningful action to protect the security of our voting system after the Russian cyberspace attacks. What are your thoughts? Van Vechten: California's system has a built-in safety: paper trails. Every vote can be traced to a paper ballot. In states without that, digital and physical safeguards exist to protect equipment, but hacking is possible. I'm more concerned about other states. U of R: An alumna asks: "What are the key races in this election?" Van Vechten: Good question! [The answer is] really "every race" because surprises happen when voters don't show up and think the outcome is assured. Headliner races in California: governor, U.S. Senate, and every House of Representatives seat. Competitive House races in California could help swing [the] House to Democratic control. Ronald Mak (@ronaldmaktweeks): Is Senator Feinstein’s campaign for a fifth term (after 26 years) emblematic of California’s reluctance for new blood/leadership in the U.S. Senate? Does the jungle primary system depress GOP voter turnout in the already-blue state? Van Vechten: First question: Senator Feinstein has cachet—long experience, national name recognition, fundraising networks, etc. She's a veritable stateswoman. [It’s] hard to compete with that, even if new blood means new ideas or directions in policy. Question two: So far [there’s] no evidence GOP turnout is lower in a top-two "jungle" primary. With nationalized elections, meaning [President Donald] Trump figures into people's decisions, more people are likely to turn out regardless of party affiliation. GOP candidates have high success rates in California's nonpartisan elections: all local elections are nonpartisan in that no party labels are on the ballot next to names. [This] applies to local races for city council, county boards of supervisors, school boards, water boards, etc. U of R: A follower is asking: “What is a ‘jungle’ primary”? Van Vechten: A "primary" election narrows the field of candidates to only two, and those two go on to compete in the November election. Usually [in non-jungle primaries], only registered Republicans vote in their primary, and Democrats vote in theirs; for example, out of nine candidates for a Congressional seat, one "wins" that round [within each party, then the parties’ candidates go on to compete against each other]. In California, our primary is a top-two variety. Instead of party members voting only for their candidates, ALL candidates for an office are listed, and ALL voters get to choose the person they want. The top two vote-getters move on to compete in November. This is the "jungle primary." Also important to point out [is] that a top-two primary does encourage participation of "no party preference" voters. Van Vechten: YES! Absentee or "vote by mail" [ballots] carry same weight and are counted with all others cast at polls. Most people vote that way in California now. New State rules make it easier to return your "vote by mail" ballot, too: [it] can be MAILED on day of election (still needing a postmark and stamp, but that is going to change). [It] can be dropped off at any polling place in your county. EvLille Boo-se (@lillitot): What if you DON'T want to vote for GOP candidates in local races? How will you find out their affiliation? Van Vechten: There are several ways to find party affiliation of nonpartisan candidates. First go to their websites, where they state their positions and background. You can do a Google search for most candidates that way. Second, if you're registered already, you might be receiving "slate mailers" (lists of candidates on postcards with recommendations about whom to vote for). These group similar candidates on lists. Candidates usually pay to be on them and associate with "like" others. Finally, go to the COUNTY organizations for each party, which list their preferred candidates: for Democrats, http://www.sanbernardinodemocrats.org, and for Republicans, https://sbgop.com. Van Vechten: This year's initiatives or "propositions" have indirect environmental effects. The water bond, Prop 3 ($8.9 billion) would allot money for flooding projects, restoration, clean water, repairs, etc. connected to severe climate events. Ronald Mak: Why is it so difficult to get Southern California representation across California statewide offices? Currently California has two U.S. Senators from San Francisco (and will likely elect a governor from there, too). Is there a Northern California versus Southern California representation problem? Does the state need more San Diego and Los Angeles representation? Van Vechten: Good question... [Nancy] Pelosi, [Dianne] Feinstein, Kamala Harris, [Gavin] Newsom, and even the Browns are central state products. Big cities with big issues launch careers! They're keyed into urban issues. Others have tried and will [try]: Pete Wilson succeeded; [Antonio] Villaraigosa won't give up; and [there are] LOTS more in the pipeline. Does Northern California or Southern California need more representation? California is vast, and many federal issues affect the state "regionally." But statewide officials have to represent and respond to all parts of the state. Prop 6 is about repealing the gas tax of 12 cents per gallon and 20 cents per gallon for diesel fuel. It would impose a two-thirds vote of the people to raise those taxes again. So... why get rid of [these fees] or keep them? Let's look at a few numbers. Who likes taxes? Pretty much NO ONE. I drive 230 miles a day in a hybrid, and I hate paying those fees. BUT I also want drivable roads. I also want my tires to be intact, no broken axles from potholes, etc. Repairs cost me a lot, too. State budgeters use gas taxes to fix roads. Gas tax revenue has DECLINED over time because of people like me: I drive a hybrid so the projections haven't panned out. There's a GIANT shortfall between what was projected to come into the state, and what is spent and also needed. We have 50,000 miles of state roads. We now have an $80,000,000,000 (that's $80 BILLION) deficit between what we NEED to fix all the existing problems and maintain those miles. The gas tax raises about $5 billion per year. Over 10 years, that's only $50 billion. So let's [say we] get rid of the gas tax. How will we pay for the needed current repairs? With bonds? Bonds cost TWICE the face amount with interest. If we really want to fix roads, taxes are a logical way to pay for them, and far cheaper than bonds. Otherwise, we can continue to defer repairs and continue to ignore the majority of state highways that need fixing. Senate Bill 1 (SB1) [the Road Repair and Accountability Act of 2017] funds are paying for fixes right now and are locked in. But it's our choice. I'd just like to know how we'll get $80 billion otherwise. Van Vechten: Yes. Props 1 and 2 are housing bonds. Part of Prop 1 funds go to housing veterans. Other funds would go to housing those with mental illness. Prop 1 would borrow money to make about 55,000 new affordable housing units available—not huge, but when you consider that we need all the housing we can get, it's a start! U of R: Thank you, Dr. Van Vechten, for a great discussion and for sharing all of your knowledge with us! And thank you, followers and guests, for being part of our Twitter takeover. Remember, your vote matters! Van Vechten: I hope we shed some light on the midterm elections. May you vote with confidence, however you vote—because whether you whisper or shout with your vote, your voice matters! Thanks, U of R for the opportunity to connect.